I live in Delhi. A place I've always thought of as home, but also a massive mess. There's the standard attitude of "I'll mess it up - the people paid to clean should do their jobs properly". I still remember a while ago (when the BJP came to power) seeing this strange man sweeping the road in front of our house. My mother asked him a few questions and found that this man had been responsible for sweeping the road outside our house for a few years now - only now he was actually doing his job. The city cleaned up quite a bit with all the people who'd been employed to do their jobs for years actually starting to do them. Hey, if I give you assurance that irrespective of whether your job gets done or not, I'm not going to fire you/cut your pay/irritate you at all in any way and you're a slacker, you're not going to get your job done. On the other hand, if I call a contractor and tell them to clean the place up, then as soon as they screw up, I jump on them and tell em I'm not going to pay them - I become king... yay! Plus, I get to pay them less by putting out bids for the job of cleaning the place. So there you have it. I drive to work every day - occasionally see a very hip looking cleaning truck trundling along the side of the road whipping up all the dust, dirt, plastic, excrement, blah into it's large belly. The roads? They're squeaky clean in Delhi now. But back the truck up just a minute (pun intended). Where do these trucks empty their guts? Well, it would seem to me that they dump the stuff quite a distance from where they pick it up - a few inches perhaps? This is a picture I took yesterday when I was heading back home from Nehru Place (a sprawling commercial complex in Delhi) just accross the road from the famous Kalka Mandir. 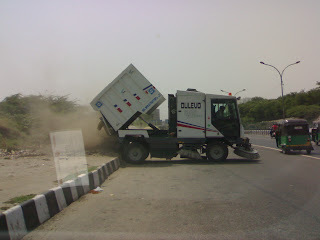 So THESE are the guys cleaning up the roads. Yesterday after I saw (and photographed) this, I thought of two things - going to the Kalkaji police station (about 100m away) and telling them (I actually went, but was in a bit of a rush to get home, so thought I'd just blog it and send it to the papers). The second was that I hadn't really looked at the sides of the roads for quite a while - they're dirtier than ever before - I guess now I know why. 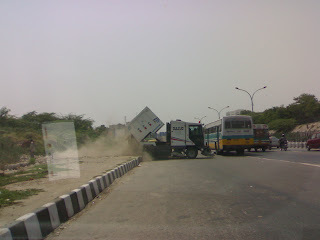 Maybe these contractors are planning on asking for a contract to clean the sides of the roads as well. I drove up to the truck and motioned for the driver to push back his window - he motioned for me to drive round to the other side of the truck which I did. His "co-pilot" gave me a big grin while he pushed his window open. I asked one question "is this the rubbish dump?" to which his immediate reply was "yes". I'm thinking I should send this around a bit more than just to the papers. Lets see what happens. De forté of Airtel... customer service??? If you've ever wanted something done that you can't do yourself, what's the first thing you do? Find someone who can get the job done right? What happens when it's your job to do it? Picture a customer care person who's being asked a question on the phone. Now picture the question as being the metaphorical equivalent of the question of the meaning of life, the universe and everything. You sit some poor kid who's fresh out of school following which they're given diction and voice training for a while and a crash course in how to read scripts from a screen at one end of the line and erm... a customer asking a few questions beyond the scope of the script at the other end. The result is either a very frustrated kid or customer. I'd rather spare most of these guys from such ordeals... I've heard them squeak "we'll have to get back to you on that" before asking me if there'll be anything else I can maim them with. Airtel (conveniently) provides a mail address where you can write to them if you have any queries, so I thought since there's no real time exchange of information, no one has to be embarrassed by their knowledge (or lack of). Also, in case they don't know the answers they can either look them up or ask someone who might know. This is my mail exchange with customer care in Bangalore (I've got a roaming number from there while I'm sitting in Delhi - Delhi customer care maintains that they can't give me any information since I'm a Bangalore customer and I need to contact them directly). 1. What is the monthly download limit on this? 2. Are there any other charges? 3. Will I have to pay extra while roaming in Delhi on Airtel's network for EGDE access? 4. What sorts of speeds could I expect assuming I use an EDGE enabled device? 5. Are any IPs/domains or ports blocked? We would like inform you this will achieve the delivery of advanced mobile services such as the downloading of video and music clips, streaming, full multimedia messaging, high-speed Internet access and e-mail on the move, multiplayer games etc. EDGE provides three times the data capacity of GPRS. Using EDGE, operators can handle three times more subscribers than GPRS; triple their data rate per subscriber, or add extra capacity to their voice communications. EDGE uses the same TDMA (Time Division Multiple Access) frame structure, logic channel and 200k Hz carrier bandwidth as today's GSM networks, which allows existing cell plans to remain intact. It will be possible to view live TV streaming on an EDGE enabled phone ? the Nokia 6230. It will not be possible to view it on any other phone, as there is no other EDGE enabled phone that supports streaming today in India.
? Service will be chargeable per channel per month.
? To begin with, CNBC News channel will be offered, subsequently Aaj Tak, Sports and other entertainment channel will be added as we continue to strike agreements with other TV channels. To access live TV, a user must have subscribed to Airtel Live portal. If not, then he needs to be provisioned for Airtel Live portal before he can access live streaming. The settings will also be made available over the website. In a nutshell, the APN is? ?airtelfun.com, proxy is disabled, and the UDP port range is from 1024 ? 65535. Currently Nokia 6230 is the only phone which supports video streaming on EDGE. Please note that by using this setting, you will not be able to access the Airtel live portal (to down load rich content like Games. Wall Papers ring tones etc) He needs to alternate between the settings as he normally does between Airtel Live (earlier called Airtel Masala) and Airtel Online. Alternatively, you could also contact our 24 Hours customer care service by dialing 121(toll free) for same. erm.... Okay Renuka... whatever you say. Not a terrible advertisement for the Nokia 6230, but you could have used a little targeting on that one. Please assume I do not have a Nokia 6230, do not want to stream TV on my phone and do not want to download any content from Airtel's portal - I just want to surf the internet on my phones - one Nokia N91 and one O2 XDA Atom Life. You had inquires about the EDGE facility on your Airtel number 9xxxxxxxxx. What kind of speeds will be available? 2 dedicated time slots will be available for EDGE. Depending on the air interface, the quality of coverage, other people in the cell area, speeds will vary between 40kbps-200 kbps. The bandwidth will get shared among as many users as present, who are using GPRS/ EDGE in that cell at that particular instant. Live TV streaming is still a new concept in most countries (in the few networks where it has been deployed), the experience depends on the bandwidth available. Equally important is the RF tuning and optimization done at the BTS level, which can perceptibly change the user experience. Typically, streaming is done at 5-10 frames per second (a TV shows 30 frames per second), so it is important to have the right expectation even before you start to view a live TV stream on a phone.
? It will be possible to view live TV streaming on an EDGE enabled phone ? the Nokia 6230. It will not be possible to view it on any other phone, as there is no other EDGE enabled phone that supports streaming today in India.
? The service will be available to both pre paid and post paid customers. The settings will have to be given to the customer over a telephone call, and will also be made available over the website. In a nutshell, the APN is airtelfun.com, proxy is disabled, and the UDP port range is from 1024 ? 65535. 2. Go to ?Media? and press ?Select? 3. Scroll down to Media Player and press ?Select? 4. Scroll down to ?Streaming Sett? and press ?Select? 5. Select ?Active Connection Settings? and press ?Activate? 6. Now Scroll down to ?Edit Active Connection Settings? and press ?Select? 9. Scroll down to ?Connection Settings? and press ?Select? 10. Scroll down to ?Proxies? and press ?Select? 11. Scroll down to ?Disable? and press ?Select? 13. Scroll Down to Bearer Settings and press ?Select? 18. Go to Standby Screen, and access the Airtel Live portal now. 19. Click on Live TV link on portal, and select the channel you have subscribed to. 20. After this, you will receive a SMS with the link to view Live TV. 22. Once this bookmark is saved, select it to connect to the TV streaming server. Hmmm... are we getting a little better now? Yuvaraj could have left the info on speed and skipped the spiel (sic) on the 6230 and Live TV though. Again, I would like to ask for responses to my queries rather than hear the sales pitch on Live TV. I have received a response only to the 4th point. You had inquired about the EDGE phone for your Airtel mobile number 9xxxxxxxxx. We would like to inform you that there is no limit for downloading in the EDGE phone and charges as per the downloading items. The games will be chargeable on a per download basis, and will be priced at Rs. 99 per game. The game will expire after 6 months. Further, we would like to inform you that 2 dedicated time slots will be available for EDGE. Depending on the air interface, the quality of coverage, other people in the cell area, speeds will vary between 40kbps-200 kbps. The bandwidth will get shared among as many users as present, who are using GPRS/ EDGE in that cell at that particular instant. The settings will have to be given to the customer over a telephone call, and will also be made available over the website. In a nutshell, the APN is airtelfun.com, proxy is disabled, and the UDP port range is from 1024? 65535. Further, any clarification you can contact our customer care center 121(toll free) for the same. Okay, I forgot to tell Karthik that I wanted to use this facility to connect to the internet - I was slightly bugged with this entire conversation by now though - the series of mail was going back and forth for quite a while by this time (yep - I made sure the entire series went back each time). Okay... one LAST time before I post this hilarious conversation on my blog. You DID respond to one question on the first mail and two on the second. How about trying for the remaining two this time? 3. Will I have to pay extra while roaming in Delhi on Airtel's network for EDGE access? 5. Are there any IPs/domains or ports blocked? Please note : I'm still NOT interested in hearing about Live TV. Airtel didn't respond to this mail at all for 8 days, so I sent them this reminder. Any update on this? It's been quite some time since I wrote to you asking for this information. Lokesh (the person who finally responded the next day) didn't really feel like getting chatty like the other customer service people did, so sent this mail. You had expressed concern on Live TV for your Airtel number 9xxxxxxxxx. We request you to kindly contact 7070 (toll free) from black berry hand sets for all the quiries about the Live Streaming. There comes that Live TV thingy again, but a Blackberry???? What's the story on that one? This guy really didn't want me to get any info, so pushes me off to the Blackberry and email tech support people at Airtel specifically telling me to call from "black berry hand sets". Damn... maybe he read the series and figured since I'd shelled out so much money on the two phones I've got that I wouldn't be able to get my hands on "black berry hand sets" and wouldn't call. Problem customer that I am, I tried anyway, and was instructed by the IVR to dial 121 - back to the old drawing board. I fail to understand from all this why they would offer a service and not tell any of their customer support folks about it. I checked the link and the content of the page and it still says the same thing. One customer support person even assured me (on the phone) that there were no other charges for this service - at Rs. 299/month I would have high speed internet and would only have to pay for downloads from the Airtel portal. I'd feel a lot safer if I got this in writing in a mail or something since I've been burned in the past (and the only unlimited data card plan is 899/month for corporate customers). Anyway, I'm sending a link to this entry to some folks at Airtel in hopes that I'll get some response (possibly even a comment) to my queries (if you'd care to check, my last reference number was 92083120782).